Normally I wouldn't blog about a stag-do, after all, what goes on tour, stays on tour. That said, there's no harm in revealing what we ate on my pal, Dark Side's stag weekend in Bristol. The lunch at any stag-do is pivotal to ensure that casualties are kept to a minimum. With that in mind, the best man played a blinder in selecting pieminister. Given that most of my readers are smart and savvy foodies, you'll have no doubt come across their pies before. And if you haven't, you can find them at Waitrose, or if you live in London, at Borough Market. 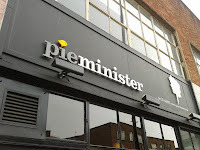 Bristol is the birthplace of pieminister, and we visited their shop on Stokes Croft. Seating around twenty, it offers a wide selection of pies, many with pun-tastic names such as chicken of aragon, heidi pie and mr. porky pie. 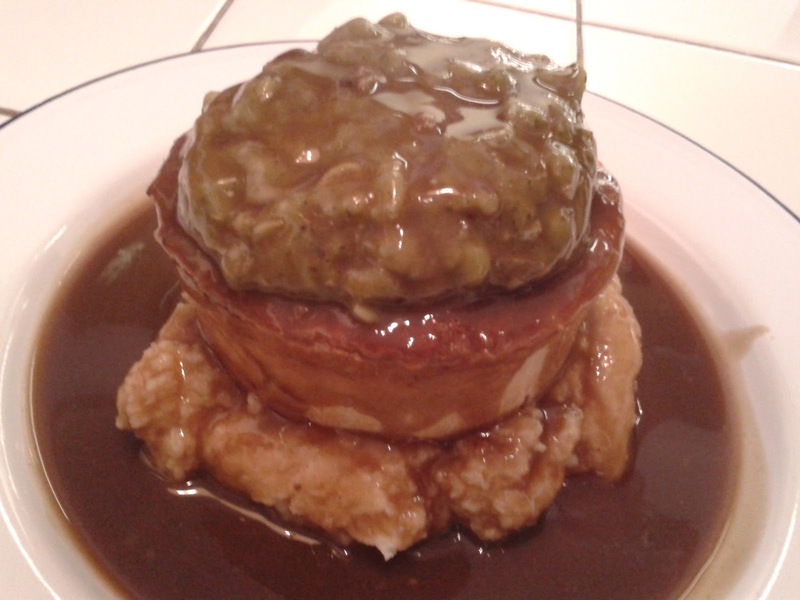 I went for the latter with its sumptuous filling of pork, apple and sage amongst other goodies. The pie was topped with minted mushy peas atop mash in a sea of gravy, and it really hit the spot providing sustenance before we checked out Bristol's finest art galleries and museums (Dark Side – do you think you anyone will take that last sentence seriously?). On the previous evening, we kicked off the stag-do with a tour of Bristol's historic harbourside. After a quiet pint or two, we decided to play restaurant roulette using Dark Side's smartphone, and it chose Wong's, a Chinese restaurant. Truth be told, my first impressions from the gaudy exterior was that the phone had picked out a bog-standard high street Chinese. How wrong I was. 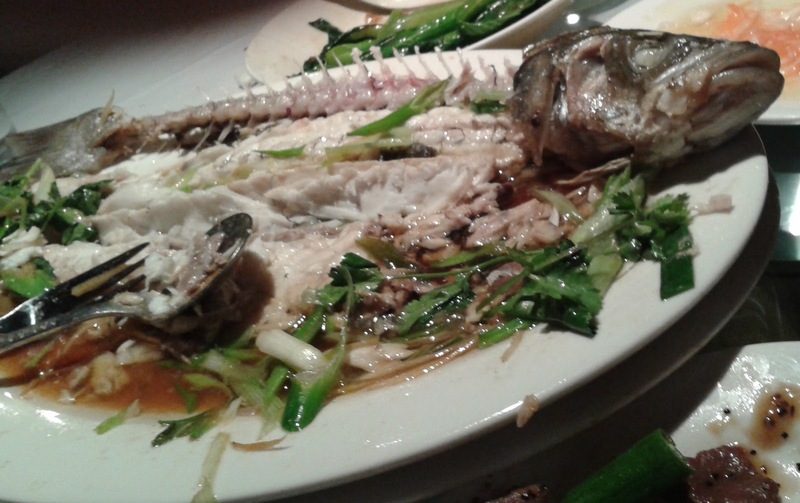 The menu is full of Cantonese classics, and highlights included an enormous steamed sea bass, perfectly al dente choi sum with oyster sauce, and a fragrant anise-scented soya chicken. Service was first class too, with the amiable owner offering advice on what dishes would suit our diverse party. Not every dish worked but more did than didn't. Without wishing to sound like a patronising git, I was surprised at the quality of this restaurant, as unlike cities such as London or Manchester, Bristol doesn't have a Chinatown and isn't that renowned for Chinese food. So it was a shame how quiet Wong's was on a Friday night. People of Bristol, do yourself a favour, and visit this gem. Bristol is a great city for a weekend away, and it was good to get the old crew together, as Mr Fussy, Italian Shetland Pony, and Mr Pak Choi amongst others were all in attendance. For a hotel option, the Future Inn Cabot Circus is both affordable and central. There is also loads of nightlife, especially around the harbourside. Postscript: As you can tell from the photo of the street art at the top of this post, Dark Side is a keen photographer. You can check out more of his work on his flickr stream, and if you like the look of his photos, they are available to purchase. Have you ever wondered what bitter disappointment tastes like? Well if you want to find out then visit Viet Grill. As is now my style, I'm keeping this review short and sweet. Besides, there are only so many ways in which one can describe bland mediocrity. The starters of wicked crispy frog (ếch rang sả ớt) and steamed 'pho' paper rolls (phở cuốn) were plain. Things didn't get any better with the mains of slow cooked Mekong catfish (cá kho tọ) and stewed Saigon pork belly (thịt kho nước dừa). The former was too sweet, whilst the latter had little of the flavour that I was expecting from the caramelised coconut juice. Just when you thought things couldn't get any worse, the noodles arrived. The beef pho was insipid, with the accompaniments not on the side, but annoyingly already in the bowl. The meal then reached a nadir in the form of the spring bowl (bún nem), which had the nước chấm sauce, again annoyingly, pre-mixed in with clumpy rice vermicelli (bún). The spring rolls and betel leafy la lot meat rolls that came with this dish were also pretty nondescript. In fact, the only dish that was any cop was the water spinach (rau muống) tossed with garlic. Dinner for three came to £68 including a round of drinks and 12.5% service. Any positives? The dining room is stylish and buzzy, although the tightly packed tables and inattentive flustered service spoil the ambience. This was my first visit to Viet Grill and I can scarcely believe that it's the same restaurant that so many London foodies adore. Have standards dropped? Possibly, as one of my dining companions recalls the food being better on previous occasions. I won't be returning here anytime soon; although I won't be missed, as this restaurant was rammed, even on a Tuesday night. In terms of eating on the 'Pho mile', I'm sticking with my old favourite, Song Que. Nissin Foods are legends of the noodle world having invented instant noodles with their Nissin Ramen (出前一丁) range before having the bright idea of Cup Noodles, which revolutionised noodle eating forever. Nevertheless, it'd be fair to say that neither of these iconic brands truly resembles fresh ramen noodles. I guess that's where the Nissin Raoh ラ王 range comes in. From the red and gold packaging, you know that this is a premium noodle product. There are numerous sachets including rich soy, soup mix, dried beansprouts and a slice of almost bacon-like fatty pork (freeze dried maybe?). Now I was a bit nervous at working out how to 'cook' these noodles but this handy video explains all. So how do these noodles taste? Damn good is the answer; I'd go so far to say that they're the best instant noodles I've ever tasted. They actually resemble real ramen with a springy QQ texture in a rich broth. I had a few reservations about the astronaut food qualities of the pork and beansprouts, but both actually tasted pretty good. That said, of all the elements, it was the rich soy that stole the show – I'd buy bottles of it if I could. Sadly, I don't think these noodles are available in Britain and I picked up this packet on my recent trip to Tokyo. If I'd known how tasty they were going to be, I would've filled a suitcase full of Nissin Raoh before coming home. PS: Whilst I couldn't track down these noodles in London, you can buy other varieties of Japanese noodles at the Japan Centre, either at their store in Piccadilly or online. I appreciate charity is a very personal matter but you can make donations for the victims of the recent earthquake on their website when you shop online. The White Stripes are a band that many musos love, but for some reason I've never really got into them. I have a couple of their albums but other than a few tracks, I might press skip more often than not on my iPod. To me, Turkish cuisine is the culinary equivalent of The White Stripes. I think Turkish food is OK but I don't worship it with the same devotion as others. Would spending five days on holiday in Istanbul change my mind? Well not really. I didn't have any shocking meals but there wasn't that definitive meal that changed my overall opinion. That's not to say there weren't a few gems so here follows my guide on what to eat in Istanbul thrown in with some travel tips on this most beguiling of cities. My number one must-eat is the mighty lahmacun. I'd never heard of this Turkish pizza, until I read about it on this blog. I just couldn't get enough of this lamb mince topped ultra thin pizza. Served with lettuce, parsley and a squeeze of lemon – it's heavenly and cost only TL2 (just less than £1). My other must-eat is arguably the city's signature dish, hamsi or Black Sea anchovies. Look out for the plumes of smoke and you shall find the hamsi man. These bad boys are deep-fried, served with salad and the biggest bread roll that you've ever seen in your life. They're quite unlike anchovies in oil and are more like whitebait. The damage? A mere TL5 (£2). In fact you can't go wrong if you're a lover of fish and seafood, and I enjoyed it nicely grilled both on and off skewers. My favourite was grilled octopus. Ah the grill. You can't get away from it in Istanbul, and if you don't want anything too challenging then stuff like kofte & chips really hits the spot. However, if you find that boring then sucuk, beef sausage seasoned with various spices including cumin and sumac, is a more intriguing option. Other stuff I sampled included meze, many variations of kebab, and some nice sweets but there was something missing. I couldn't quite put my finger on it but then it dawned on me at the end of the trip. I missed pork. Now obviously for cultural and religious reasons, pork is off-limits in Turkey but that didn't lessen my yearning. And I guess that's probably why Turkish food will never be one of my favourites. The main areas of town are on either side of the Golden Horn. To the south lies old Istanbul with its blockbuster sights like the Topkapi Palace, Haghia Sophia, Blue Mosque, and the Grand Bazaar. To the north, over the Galata Bridge, lies Beyoğlu where you'll find shops, restaurants, cafés and bars – mostly on and off the main pedestrianised thoroughfare, Istiklal Caddesi. To put it another way, spend your days in old Istanbul and your nights in Beyoğlu. With the exceptions of a couple of bars, I'm not going to recommend any specific places but instead focus on the lively parts of town. As I previously mentioned, Beyoğlu is where it's at and there's always loads going on. Plenty of bars and meyhanes (meze and grill restaurants) can be found on the side streets just off Istiklal Caddesi such as Cicek Pasaji, Nevizade Sokak, and Balik Pazari (Fish Market). My perception is that the Cicek Pasaji is a bit of a pricey tourist trap and that better value can be found on Nevizade Sokak and Balik Pazari, where you can also find some hamsi stalls. Back on Istiklal Caddesi is the Richmond Hotel, home to a stunning restaurant and bar called Leb-i-Derya. This is definitely the place for cocktails with arguably the finest views of Istanbul's unique skyline. Sadly the food didn't pass muster and I expected better for TL350 (apx £140) for dinner for two (three courses, a bottle of red and a tip). Don't get me wrong; there wasn't anything wrong with the signature forty-spice beef fillet or any of the other dishes, it just lacked any wow factor. Service was also hit and miss although they did redeem themselves with a complimentary hazelnut vodka to round off the meal. The other bar worth a visit is on Nevizade Sokak and is simply called '27'. There's no signage other than a red painted number 27, and once the doorman lets you in, you should head up the stairs to the top floor. Located there is a bohemian looking bar with battered armchairs and sofas, where a DJ plays some top tunes. My only fear is that its hipster credentials have been irrevocably destroyed by the presence of my mate and me. I didn't help matters when I asked the DJ whether she had any Stone Roses, Happy Mondays, or New Order. In case you're wondering, she did have some New Order but she pointed out that she doesn't do requests. The other area that's good for nightlife is at the end of Istiklal Caddesi near Tunel Square. Check out the cobbled side streets for a selection of cocktail bars and meyhanes. This area is also home to quite a few 'international' joints serving burgers, pizzas and pasta. These places seemed inexplicably popular with young Turks. If you carry on walking from here toward the waterfront then you'll hit Karakoy Square, where there is another fish market, from where you can pick up more hamsi. Old Istanbul isn't half as lively but it is more than likely that you'll be there during the day. Beware of the obvious tourist trap restaurants (you can identify them by the touts and the mixed Turkish-International menus) near the blockbuster historical sights. It's worth walking 10-15 minutes away back along the tramline towards Galata Bridge to eat at places with a more local feel. Due to a mix-up by hotel management over the dates on my Expedia booking, we stayed at two hotels, our original choice, Mia Pera, and our back-up for two nights, Gezi Hotel Bosphorus. Both are fine boutique hotels in Beyoğlu, and whilst the former is better located for nightlife, I preferred the latter. That said, the rooms we stayed in at the Mia Pera were enormous, as we were upgraded after the initial mix-up. By the way, I was very impressed at how Mia Pera's management handled the situation. They apologised profusely, arranged alternative accommodation, and loaded our luggage into a waiting hotel car before we managed to finish our complimentary coffees. For a guidebook, Time Out is pretty good, especially for eating and drinking tips. However, I dislike some of the pretentious prose and right-on attitude. If anyone from Time Out is reading this, we don't need to know the favourite haunts of Istanbul's left-wing intellectuals, literati and thespians. To get around, it's easier to walk or take the tram rather than get stuck in traffic in taxis. The tram is part of the Metro network and is very easy to use with jetons or tokens costing a flat TL 1.75. Look out for the jeton machines in and around tram stops. I've finally tracked down a decent version of General Tso's chicken (左宗堂雞) in London. Never having had a proper rendition of this American-Chinese dish before, I wasn't sure quite what to anticipate. That said, it felt more real compared to my previous brush with what turned out to be a fake General. From what I read and had been told, I was expecting a tart piquant dish with sweet undertones. I wasn't disappointed. It was hotter and less vinegary than I expected, but very moreish nonetheless. So where did I finally track down this dish? It was at the relaunched Ba Shan, previously a xiao chi (小吃) or 'small-eats' joint, that now specialises in Hunan cuisine. The General Tso's chicken was one of many delights, as we also enjoyed in no particular order: mashed aubergine, potato slivers, duck egg with chillies, beef brisket in mini-wok, Peng's fried tofu, hand-torn cabbage, steamed catfish with salted chillies and noodles, and Chinese bacon with dried radish. Everything was excellent, and the dining room had a warm charm that is all too rare in London's Chinese restaurants. All told, a brilliant dinner with some excellent company. Highly recommended. Apologies for the brief write-up but I've got review fatigue. The thing is I'm finding it increasingly difficult to do a full blow-by-blow account of the restaurants that I visit. That's not to say I'm getting bored of eating out in London; it's just that I'm not up for writing about the experience at any great length. I hope you understand and I'm not ruling out a return to writing 'proper' restaurant reviews should I get my mojo back. In the meantime, I'll be blogging about other stuff that I hope you'll find as interesting as I do. ... then you might want to try Golden Day on Shaftesbury Avenue. It isn't as accomplished as Ba Shan but it also serves Hunan cuisine. PS: For a more in-depth review of this meal, by The Grubworm, please click here. I don't often get feedback from restaurants so I was genuinely surprised to receive an e-mail from Alex Moore of Rosa's. Truth be told, I was a bit apprehensive given that I'd written a less than glowing review of the Soho branch of Rosa's. Anyway, it was with some relief that the e-mail was a lunch invitation to discuss my comments about their calamari and pad Thai dishes with Alex and his wife, Saiphin. I accepted the invitation; after all, you don't often get the opportunity to offer feedback to restaurant owners in the flesh. I thought I was just going to have a chat so it came as a bit of a surprise when Saiphin told me that she had been working on ideas on how to improve both dishes. First up was the Thai calamari that in my opinion was underseasoned. To rectify this, Saiphin added a ground mix of salt, white pepper, coriander root, lemongrass, and palm sugar to the batter. This definitely gave the calamari more zing, which was amplified when tossed in a wok fried mix of diced onion, red and green peppers, deep-fried chillies, lime leaves and lemongrass. The plum sauce also complemented this dish well, and all told it was a big improvement. Next up was the pad Thai, which I thought was too sweet. Saiphin didn't necessarily agree with my point of view, although how sweet something tastes is very much a subjective opinion. This time round, the pad Thai was better balanced but still a bit too sweet for my taste. I also sampled lamb satay and beef green curry to get a better feel for Rosa's menu. Both were above par, in particular the green curry that was pepped up with lesser galangal and a mix of other ingredients that remain a secret. It was one of the best Thai curries I've tasted in a long time. During lunch, I also gained an insight into the challenges of running a Thai restaurant in Britain. The main difficulty seems to be getting the right ingredients as Saiphin explained that it was so much easier to get supplies in Hong Kong – where she used to run a restaurant – compared to London. For example, she'd like to use fresh rice noodles in the pad Thai but so far has been unable to find a supplier that meets their requirements. I feel mildly embarrassed that Alex and Saiphin went to so much trouble over my comments about Rosa's. That they did shows how much they care about their restaurant. Now I appreciate that being invited to lunch by the owners of the restaurant isn't entirely representative of what a paying customer might expect. Having said that, I will be giving Rosa's another chance probably with an order of Thai calamari and a green curry. PS: Such is the small world we live in, Saiphin bumped into this gangly blogger on a recent visit to Hong Kong. Rather scarily she remembered that his regular order used to be green curry. Decent street food is hard to find in Blighty, so when I came across K & K Fresh Foods, I was always going to check it out. It was love at first smell, as the smoky aroma from the grill lured me over to join a lengthy but fast moving queue. As I got to the front of the queue, the grill came into sight. Purists might take the view that seekh kebab and chicken tikka ought to be prepared in a tandoor, but I didn't really mind that it was done on a grill. Taking my cue from the regulars in front of me, I went for the mixed roll (£3.50). I looked on as chunks of juicy chicken tikka were combined with moist seekh kebab in a freshly griddled paratha with salad and raita. I couldn't wait to tuck in, so I sat down at one of the plastic tables at the side of the stall. As I unwrapped the roll and took a bite, I found myself transported to a faraway land. Sadly this fantasy was somewhat ruined by the grey skies and the pitter-patter of raindrops on the protective canopy. Mind you, the typical British weather didn't detract from this most excellent lunchtime treat. K & K doesn't limit itself to the grill, as it also offers a selection of biryanis and starters such as onion bhajis and samosas. I sampled a vegetable samosa but to be honest it wasn't much cop. Mind you, I didn't give that much of a toss as it only cost 80p. So where is this amazing stall? Tooting, Southall, Wembley, or perhaps somewhere in the East End? In actual fact none of those places, and strictly speaking, it isn't even in London. I could keep you guessing but I'd doubt that you'd get the right answer. That's because K & K Fresh Foods is based just outside Zone 6 in Staines. It's such a shame that there aren't more street food stalls like this one, as let's face it, Ali G's hometown is a bit out of the way. In the meantime, I just might try and find an excuse to visit our Staines office on a more regular basis. Pho in Warsaw? I kid you not. I didn't actually eat at Hung Vuong, but this Vietnamese restaurant was across the road from the hotel I was staying at. The presence of a Vietnamese community in Poland isn't as incongruous as first appears. It's a legacy of the communist era, which saw many leave the old country to work in Eastern Europe.